The first film to really gain much in the way of traction in 2012 is JOE CARNAHAN’s thriller THE GREY, in which a plane crash in Alaska leaves the few survivors surrounded by hungry grey wolves. 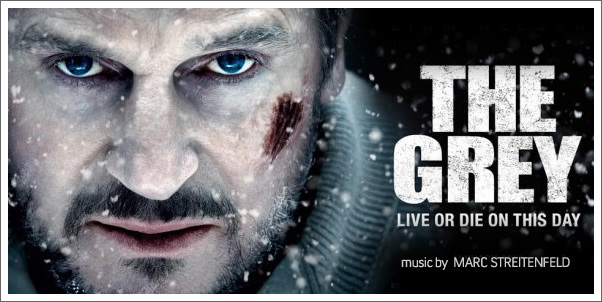 Professional wolf hunter LIAM NEESON must lead the band’s defence against the predators, but grapples with his own thoughts of suicide. The surprisingly philosophical contrast between individual and group survival that the film explores has garnered significant critical praise, despite an ambiguous ending that was unfortunately spoiled by many of the film’s trailers. The film is produced by RIDLEY SCOTT, and it is therefore hardly a surprise to see his regular composer of the last few years, MARC STREITENFELD, along for the ride. THE GREY, truth be told, is not a music-friendly film. With gritty realism the intent throughout, CARNAHAN and STREITENFELD were content to leave much of the film unscored, supported mainly by the howling Alaskan wind (at least, let’s hope it was only the wind…) and other sound effects. Thus, the 35-minute album presented here likely represents the extent of STREITENFELD’s minimal contribution – minimal in both quantity and approach.